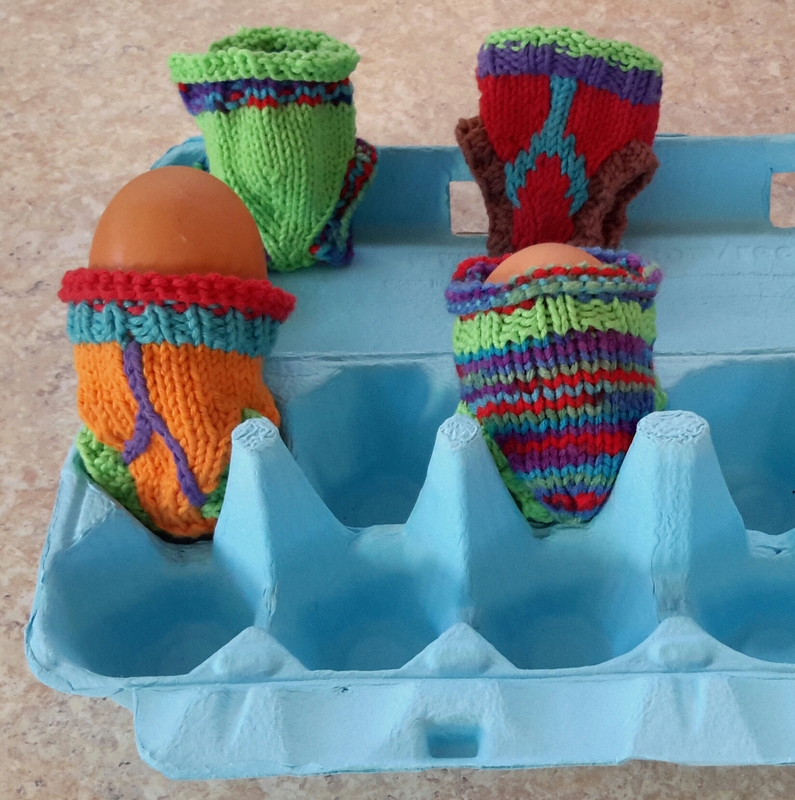 Egg cosy undies – Craft-a-licious . .
Life is going very well. The caravan is holding up superbly and the landscape, though dry, is very picturesque. I have actually been doing quite a bit of late – due to Handy Husband (HH) finding others to go prospecting with – so he does not have to impinge on his goodly wife to go with him – yay! Goodly wife, when she does go, must sit in the car (as flies far too rapaciously awful to even consider sitting outside to knit in the beautiful wide open spaces). Boo (the spoilt miniature fox terrier) must also stay (hyperactive and long clawed) in the car with me. Her canine habits of sniffing any sort of hole, grass, rock, dirt, air .. is problematic as many poisoned dog baits have been laid (to control wild dog populations), snakes are also coming out of hibernation and eagles think she is just the right take away meal size. Great. Boo and my relationship went through a rough patch there for a while. The car just wasn’t big enough for the both of us. Needless to say I am VERY happy to stay in van at caravan park where I can walk the dog, cook, eat, knit, read, write, eat, felt etc. Yes, life is fabulous now HH has found some friends! The unfortunate side effect of this happiness is an expanding waistline. A small price for the happiness though. I’m also doing some online ‘Blogging University’ courses. Yep, getten smarter-er [she hopes with crossed fingers]. You may have even spotted some changes to my pages already. But can I keep the momentum going? History shows it’s not looken too good..
Breakfast accessory items. Small, some may even say – insignificant. For those of us with an attention deficit disorder when it comes to creating large objects, well, breakfast accessories are really good due to their dainty sizes, so can be satisfyingly quick to finish. I’ve been thinking lately that if I was sitting down to brekkie and was confronted with a boiled egg cosily wearing a pair of underpants – well, it would certainly make me smile. Not entirely sure it would do its job of keeping the egg warm, but it would be amusing, making a great start to the day. Perhaps a pair of grandfather Y fronts, or brightly coloured, cheeky unisex ones. Then, of course, some knitted then felted ones using the last (eek!) of my lovely Noro Koreyo yarn. So many options! Not enough time! NEED MORE YARN!!! AAArrrggggg!!!! [dying of frustration]. Thx for your kindly comment Trishy. Does this sewing machine purchase mean you’re trading in knitting for quilting? What’s goen on there?? Cath these are the cutest lil bits of frippery I’ve ever seen! How COULDNT you smile at your morning eggs all pimped up in their underwear? Both y fronts and unisex are sweeeeet! The other 3 are just wonderful – now I understandy why you are luvvin the noro yarn! Both the colours and amazing shapes are amusing, unexpected, so gorg in their triffidy, delicately prehistoric kinda way. Your site has entered a new era of profesh coolness -congrats for learning new technical stuff! It’s smooth and easy to read. I do notice howeva that it’s been graffitied by Trash already tho. She sleeps with one eye open just so she can be top comment tsk tsk. FG – you are always so eloquent, and understand exactly what I am trying to achieve – your comments are golden!! Very glad you likey my new super technicackle skillset used to create the new-look bloggy facade – Thank you! Hi Cathy, As per usual your posts are very entertaining. Sounds like your journey is very interesting and also a lot of fun…well done. Take Care Cath and look forward to catching up one day when you eventually return😀💐🍹…….CHEERS. Jenny. Jen! Thx so much for taking the time to comment, I always appreciate hearing from you – I hope you’re also in fine form leading into the footy finals (yes – Gasp! I’ve actually heard they’re coming soon-ish). I do hope all’s well where you are, and I’ll make sure our paths cross when I (eventually) return!